New York City is home to what might be the world’s most competitive and talented restaurant scene, and Manhattan is ground zero for the passion and creativity that is the signature of New York fine dining. If you are heading to New York, this is your guide to touring the best restaurants in the city’s most lavish borough. Per Se: You will want to score a seat at this small restaurant overlooking Central Park. Owned by Thomas Keller, Per Se’s French fare has earned three Michelin stars (only nine other restaurants in the US have achieved the same) and has twice received four stars from the New York Times. Diners can choose from a vegetarian or non-vegetarian nine-course prix-fixe tasting menu. This is the crème-de-la-crème of Manhatten dining. Momofuku Ko: It is a remarkable challenge to get into one of the twelve seats at Momofuku Ko, but when you do you will understand the reputation that this part-French, part-Asian, all-innovation menu has earned. With two Michelin stars and a young chef, David Chang, who has been elevated to godly status by diners and foodies across America, you can expect the food to be creative and pretty near perfection. You can expect to spend two hours enjoying eight courses at the counter that surrounds the simple galley kitchen. This is an intimate experience that balances luxury dining with simple surroundings and visibly hardworking culinary artists. 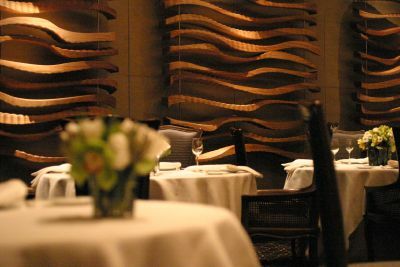 La Bernardin: This three Michelin starred restaurant is a confirmed Manhattan favourite, having also secured Zagat’s top position for most popular restaurant. The idea for La Bernardin was conceived in France by a brother and sister who loved seafood and has mastered presenting it in simple French preparations. The New York location was opened in 1986 and has been achieving excellence and breaking records ever since. There are lots of options for prix-fixe and tasting menus with or without wine pairings, but be aware: this restaurant is for fish lovers only! Masa: For fine Japanese dining, Masa is the best in Manhattan, as evidenced by the three Michelin stars it has accrued. Chef Masa is the son of caterers who owned a fish shop in Japan. He started as a dishwasher at one of Tokyo’s most legendary sushi restaurants and worked his way up to the highly respected status of sushi chef. The food at Masa is governed by two principles: shibui (lacking any unnecessary details) and umami (basic essence of flavour). You can expect to enjoy simple, honestly presented Japanese food, made with the best ingredients, each element of which will be celebrated.